The foundation of the Suburb of Haberfield. The Dobroyde Estate formed the present suburb of Haberfield, with well-defined boundaries dating back to the grant to Nicholas Bayley. Governor Francis Grose originally granted 30 acres of this land to Walter Brody, a convict who was a master blacksmith. It was known as Brody's Farm. It does not seem that Brody worked or lived on the land. Brody's grant was later consolidated into the grant given to Nicholas Bayley on the 9th August 1803. This was a grant of 480 acres, bounded by Long Cove Creek on the east, Iron Cove on the west, and Parramatta Road on the south. Nicholas Bayley was an Ensign in the NSW Corps, who arrived in the colony on the convict transport, Barnwell. He held the grant which he called Sunning Hill for about 18 months, selling to Simeon Lord in March 1805, for £850. It is doubtful whether Lord lived on the farm, which he called Dobroyde after a residence of his mothers family in England. He had considerable property and warehouses in Sydney, and conducted business in the areas of trading, auctioneering, importing, whaling and sealing, and timber getting. He was also involved in the manufacturing industry, having a tannery and woollen mill at Botany Bay. Newspaper reports and advertisements refer to the farm as belonging to Simeon Lord as early as 1806. In one the farm is mentioned as formerly the property of Nicholas Bayley. Simeon offered the farm for let in advertisements in 1816 and 1824, suggesting that he did not have an interest in residing there himself. At some time in the 1820s Lord took out a mortgage on the farm. 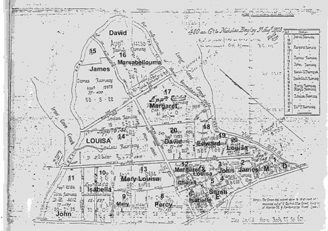 The Sydney Gazette of Saturday, 7 December 1816, states: to be leased for one, two or three years an eligible farm called Dobroyde, situate about 5 miles from Sydney on the Parramatta Road, comprising 1500 acres more or less, of which about 40 are cleared and divided into paddocks. The whole of the land is enclosed, being bounded on the Parramatta Road by a ditch and hedge bank and on the other sides by Iron Cove, Long Cove, and the Parramatta River. On the farm is an excellent villa fit for the reception of a small genteel family with suitable detached kitchen, dairy, stable, coach house, piggery, cow house and stock yard, together with a most productive garden containing some of the finest fruit trees in the colony. This farm possesses the advantage of an adjacent run for cattle of about 800 acres on the left of Parramatta Road between the Liverpool Road and Iron Cove, extending to Canterbury and the Cooks River. Possession may be had on the first of January next. Lord overstated the size of the land, but would have been close if adding the run for cattle to that of the farm. In 1824 he advertised the farm for let or sale, but following this he took out a mortgage on the property, which he transferred in 1826 to David Ramsay. On 31 March 1825, David Ramsay married Simeon Lord's daughter Sarah, at St Phillips Church, Church Hill in Sydney. After 2 voyages to New South Wales, David had decided to set up a business venture with Captain Thomas Raine, and in October 1824 advertised the firm in the Sydney Gazette as Raine and Ramsay. In her marriage settlement, Lease and Release dated 8/9 March 1826, Simeon deeded the house and farm to David and Sarah Ramsay, protecting the interests of Sarah and any children of the marriage. Under the terms of the settlement, David Ramsay put up a bond of £4,000 as surety of his intention to repay at 8% a £2,000 mortgage to Solomon Levy for his father-in-law. The land was released by Francis Williams and Simeon Lord in consideration of a marriage had and solemnised betwixt the said David Ramsay and Sarah the daughter of the said Simeon Lord, with the payment of and a five shillings apiece. Sarah Ramsay was to receive and take rents, issues, and profits, etc freed from the control of David Ramsay. Should Sarah predecease David, he was to have the use of the land. However on his death the land was to revert to any children of the marriage. David Ramsay lived at Dobroyde until his death in 1860, and Sarah continued to live there until her death in 1889. David established a plant nursery, the Dobroyde Gardens, below Dobroyde House near Long Cove Creek. The nursery was on land left to Edward Pearson Ramsay, but perhaps neglected by him for a time, as in 1867 Edward P Ramsay advertised the New Dobroyde Plant Nursery. Always with an eye to business and investment, towards the end of the 1820s, David had an inn constructed on the Parramatta Road, at its junction with the Liverpool Road. The inn was known officially as Speed the Plough, but was referred to locally as the Plough. The inn remained as a landmark for the next 80 years. In Speed the Plough, Ashfield 1788-1988, S and R Coupe describe it as a substantial two-storey sandstock building with a shingle roof and with a wide verandah on the street abutted at each end by a single-storeyed wing. In front on either side of the pole bearing its sign stand two horse troughs carved out of huge logs. David Ramsay did not run the inn, but leased it firstly to Charles Jordan, then to John Ireland, whose wife took over after his death until 1849. From this time the inn was leased to a variety of proprietors until John Burrage became the last licensee in 1906. After David's death in 1860, Sarah had a legal document drawn up dividing the land between the children of their marriage. Mary Louisa had been given a portion of the land in 1855 at the time of her marriage to Alexander Learmonth, and it was on this land that Mary Louisa and Alexander Learmonth built Yasmar. This document also set the boundaries for the land which was to be conveyed to the Presbyterian Church, for the establishment of the school, Church, Manse and burial ground. In 1869 the land was conveyed to the Church, with conditions set out for the preservation of the Vault reserve for the Ramsay family. In the 1880s the land became known as Ramsay's Bush. Largely unfenced an untended, it became a camping place for gypsies and Aborigines, and by the 1890s, Dobroyde farm had become a desolate area, overgrown with weeds and a dumping place for local rubbish. The unfenced land was a haven for the unemployed, who camped out in the bush during this time of depression. An article in the Advertiser of 28 December 1895, describes a shooting incident in Ramsays bush. In 1885, part of Isabella's portion was advertised for sale by auctioneers Batt, Rodd and Purves, this being the first subdivision of the estate. The land stretched between St David's Church and the Parramatta road. Real estate sales slumped after this time, and it was not until Richard Stanton, a house and land agent, and auctioneer, bought a considerable part of the 460 acres in 1901 that further subdivision occurred and the development of the Garden suburb of Haberfield began. Stanton had been at one time Mayor of Ashfield, and following in his fathers footsteps as a land developer. Patrick Stanton had been a land agent in Summer Hill, and Richard took over the business after his death. The area was ready for development, with the Ramsay children each owning small portions of the estate, the tramway which gave ready access to the city, and the deterioration of Ramsays Bush. Local residents were pleased that the land would be cleared and the undesirable campers removed. Stanton conceived the idea of developing the area into a garden suburb, purchasing an area of 16 hectares belonging to Margaret Ramsay in 1901. He called the area Haberfield Estate, and began to advertise housing blocks for sale with conditions. He announced his intention to build villas, to kerb streets and extend finance to buyers. He imposed covenants restricting the type of building (one house per block, of one storey), materials (only brick and slate or tile) and set back from the road. A minimum cost was imposed, with houses having to cost more than £400, raised to £500 the following year. There were to be no hotels in the suburb. The suburb's aesthetic appeal was enhanced by the gardens established by residents, and the tree lined streets. Buyers would be interviewed at an office in Ramsay Road, to discuss their design and ensure it conformed to the standards set. In 1902, a second subdivision was set up on the southern side of Ramsay Road, and by 1912 the company had bought three more estates for development. With this final acquisition, the Plough Inn was finally demolished in 1911. In 1912, the land along Long Cove Creek on which David Ramsay had created his plant nursery was subdivided. Richard Stanton acquired the property on which Dobroyde house stood in 1905, at which time it was still occupied by members of the Ramsay family. 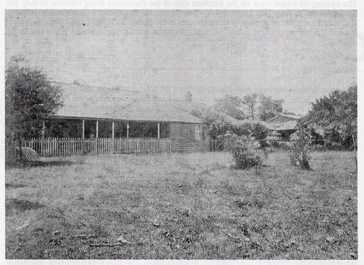 He demolished the house and built The Bunyas, named after the trees that had stood in the garden of Dobroyde House. Stanton did not comply with his companys covenants, and built the only two storey house on the Haberfield Estates. He moved into the house in 1907. There were few such substantial houses on the estate, another having been built in Stanton Road by his associate W H Nicholls. The Bunyas was purchased by the Boy Scout Association of NSW in 1985. It was restored and opened as their headquarters. In opposition to Stanton and Nicholls, the Haymarket Land, Building and Investment Company opened up the first part of its Dobroyde Estate in 1905, and later in the same year, the Northcote Estate was opened. In 1910, competition between the companies was strong, and although the Haymarket Company did not impose the same restrictions as Stanton in its earlier subdivisions, when some narrow weatherboard houses were constructed, it did apply restrictions in later subdivisions. Although Dobroyd was the name used to designate the area, the suburb gradually became known as Haberfield. The remaining Ramsays petitioned for the retention of the name Dobroyd when the post office was established, but the Mayor of the time on behalf of the Council, pointed out that the name Haberfield was now in general usage, and the petition was denied. For further information on the suburb of Haberfield, you might like to look at these web sites.